Our main focus moving onto the boat was to do as much sailing as possible so we can hopefully we can sail to the Pacific Island in May 2013. Also the NZ waters are pretty chilly and we started boating in the middle of winter. 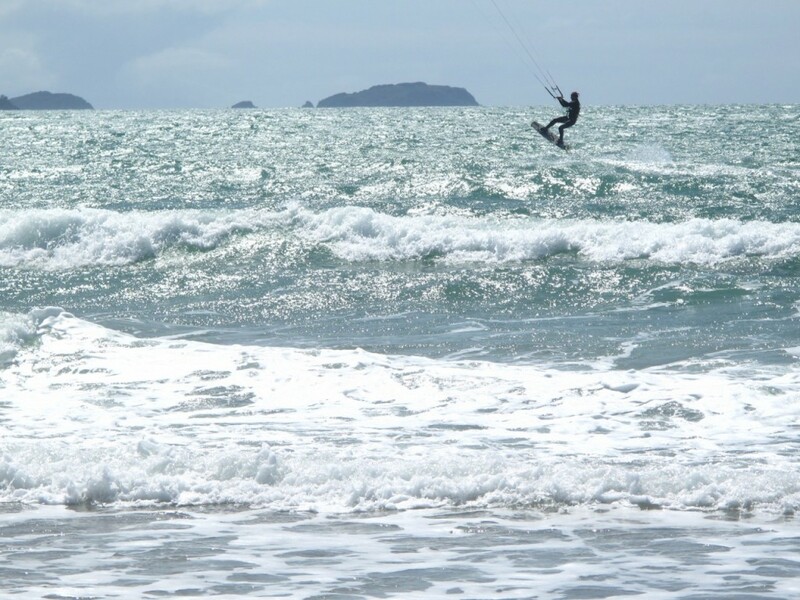 Sooo we hadn’t had a really good Kite surf in ages. Robin and I had been scoping Motuihe Island in the Hauraki gulf for a while. It looked like the perfect spot to try for our first boating/kiting mission. For one the island is small and easy to get from one side to the other ie anchor on one side in the calm, kite on the other side. Also the anchorages are top notch on both sides so whether the wind is blowing from the North or the S-SW kitesurfing should be a goer. Turned out we picked it like a dirty nose. Whoop. Found a day with a 15 knot NE blowing straight into the beach, parked the boat on the southern side of the island, looking back over Auckland city. And while everyone was in their cubicles we had an awesome session. Slightly choppy, the most freezing water i’ve ever kited in, but awesome fun. Definitely recommend anyone who hasn’t tried the sport to get into it, so so so fun. Then that afternoon we were joined by a pod of dolphins sailing away from motuihe. Amazing.